I'm proud to announce that our company, the Praetorian Group has been named one of seven national finalists for the 2011 U.S. Chamber of Commerce DREAM BIG Small Business of the Year Award. We've worked hard to build a great company dedicated to helping First Responders better protect their communities and save lives. The recognition is a great honor for me and my team and validation that despite being a small company, we are making a big difference out there in the world. We'll represent the Western region in vying for the top spot. The award recognizes small businesses in the U.S. for their work to restore job growth and economic prosperity. We're being recognized alongside top businesses across a wide variety of markets, each with less than 250 employees and $20 million in yearly revenue. Companies were evaluated in areas such as business strategies and goals, customer service, staff training and motivation, and community involvement - all areas in which we excel. 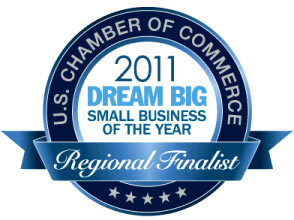 I'm reading: Praetorian Group named one of seven finalists for the top small business of the year by the US Chamber of CommerceTweet this!